As many of you know my family and I love to play games. I especially love to find games that require my kids to use different thinking skills. One new game that will get your kids as well as yourself racing to win is a dice game called Tenzi. This game will have everyone in the family racing to beat the others while using their dice. I had the opportunity to do a review on the dice game Tenzi, and let me say that my family had a lot of laughs. Everyone gets ten dice. Someone says ”Go.” Then everyone rolls and rolls as fast as they can until someone gets all their dice on the same number. Sure, there are a few more rules, but you get the idea! My family has really enjoyed the game Tenzi. It is made for the whole family. The ages are 7 to 97 but our 5 year old has had no problem playing along with us. I would say depending on your child's skill level will determine whether or not they can play with you and really enjoy themselves. The game itself is very simple without requiring tons of cards, pieces, money and a board. All you use is the included dice. When you play the game each person grabs all color of dice all ten dice. 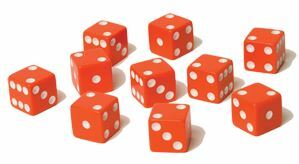 Then one person says go and each of you start rolling the dice until all of them are the same thing. If you roll three '4's' then stick with the 4's. Then all you do is grab the remaining dice and keep rolling until they are all the same thing. Whoever gets all of their dice the same the fastest wins. Super easy and super fun. I love that it has my kids looking at the dice and seeing what they need really fast. I am really impressed with how fast my kids were able to decide on the dice they needed until they would win. I also love the cleanup. This will also make for a great game to take on trips. Where to purchase: You are able to make a purchase from the Tenzi website for $13.95. This would be a fun game for my family. We love to play games....actually, we are going to have Game Night right after we finish supper. This could be a favorite! We have game night at least once a month and its hard to find games that the adults and kids like. This one might work! This would be for all the family.